Colin Kaepernick applauded the protest, tweeting, "#ImWithReid." Eric Reid, a defensive back with the Carolina Panthers, took a knee on the field on Sunday during the national anthem before a game against the New York Giants. The game marked Reid’s return to the NFL after an uncertain few months as a free agent which he believes were because of his continued protests against racism and police brutality. Reid’s contract with the San Francisco 49ers expired in March and he remained unsigned until two weeks ago, when he joined the Panthers on a one-year contract. The news of Reid rejoining the NFL came amid speculation by some fans and players that the 26-year-old had not been signed due to his activism on the field. "I think we all know why he hasn't received a call," Carolina Panthers wide receiver Torrey Smith, a member of the NFL Players Coalition, said days before Reid was signed by the Panthers, echoing a suggestion previously made by others in the coalition, including Devin McCourty from the New England Patriots, and Malcolm Jenkins from the Philadelphia Eagles. 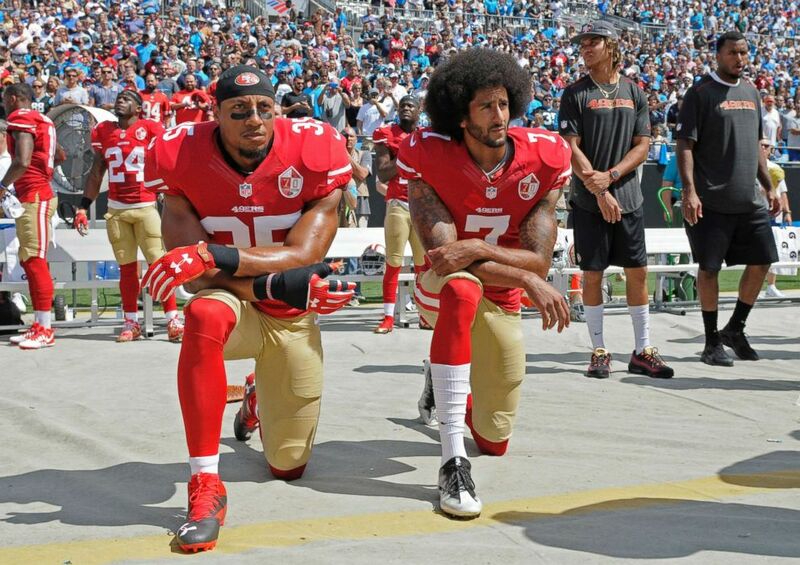 (Mike McCarn/AP, FILE) San Francisco 49ers' Colin Kaepernick (7) and Eric Reid (35) kneel during the national anthem before an NFL football game against the Carolina Panthers, in Charlotte, N.C., Sept. 18, 2016. “The notion that I can be a great signing for your team for cheap, not because of my skill set but because I’ve protested systemic oppression, is ludicrous,” Reid tweeted in March. Reid was the first to join teammate Colin Kaepernick in taking a knee during the National Anthem in 2016. Reid and Kaepernick filed a grievance against the NFL in May, claiming that league owners colluded to keep them from playing because of their protests on the field. Reid said last week he wasn't sure whether his protests for social justice would include taking a knee during the national anthem but added that he doesn't plan on dropping his grievance against the NFL even after getting signed. 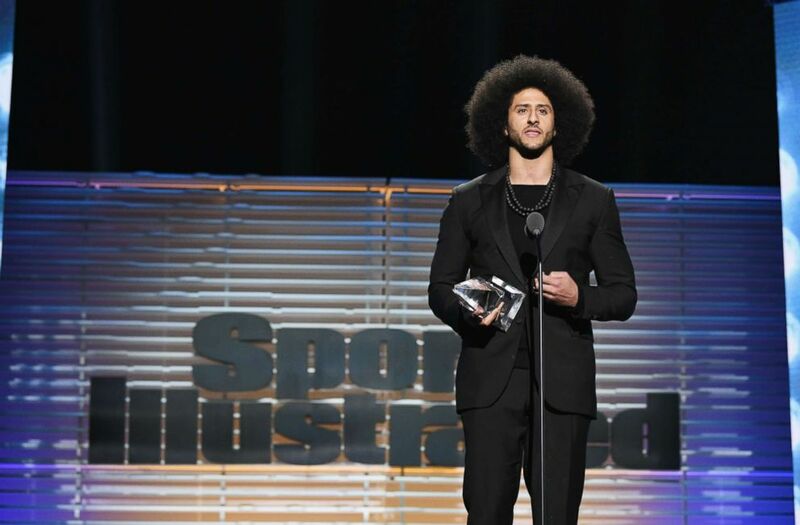 Kaepernick, who has remained unsigned, has continued to work for social justice issues, becoming a symbol of the modern civil rights movement. (Slaven Vlasic/Getty Images for Sports Illustrated, FILE) Colin Kaepernick receives the SI Muhammad Ali Legacy Award during the Sports Illustrated 2017 Sportsperson of the Year Show, Dec. 5, 2017, at Barclays Center in New York City. On Sunday, Kaepernick tweeted his support for Reid’s protest. "My Brother @E_Reid35, with @KSTiLLS and @iThinkIsee12, continue to take a knee against systemic oppression. They are unwavering in their conviction! #ImWithReid," former San Francisco 49ers quarterback Colin Kaepernick tweeted on Sunday, in support of Reid. One year ago Pres. Trump ignited a feud with the NFL and he won't let it go. But there's no sign that protests are letting up. Miami Dolphins wide receivers Kenny Stills and Albert Wilson, who protested during the preseason, became the first players to take a knee during the 2018 regular season. ABC News has reached out to the NFL for a request for comment, but a call was not immediately returned.